The name Brian Bouldrey may be familiar to many American Pilgrims on Camino (APOC) members as he was the lauded keynote speaker at the APOC 2016 conference. The 2016 annual gathering was themed “Telling the Way Within,” and included a pre-conference travel writing workshop presented by the editor/writer who teaches creative writing at Northwestern University. While some writers share journeys to religious shrines as in Sharman Apt Russell’s “Buen Camino” and Russell Scott Valentino’s “An Accidental Pilgrimage,” others move along Laura Ingalls Wilder’s prairie (Kimberly Meyer) or the Grimms’ fairy-tale road (Raphael Kadushin.) Though some stories read like raw, black-and-white documentary film footage of the writer’s experiences, others like my favorite essay “The Terriblest Poet” (Brian Bouldrey), and Kadushin’s “Driving the Fairy Tale Road” feel like they were shot for the big screen in panoramic Technicolor. After reading these essays that are not just about place, but also about the inward journey and outward movement of getting to that place, you’re sure to find several that will move you as well. The engaging, 280-page book is available on Amazon at www.amazon.com . Brian Bouldrey has written eight books, including Honorable Bandit: A Walk Across Corsica, and edited six anthologies, including Traveling Souls: Contemporary Pilgrimage Stories. 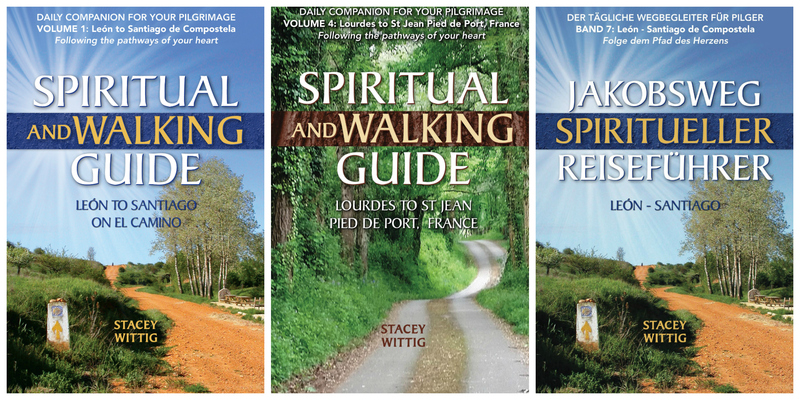 Stacey Wittig is author of three books including Spiritual and Walking Guide: Lourdes to San Jean Pied de Port, a guide for both the inward and outward journey. This review originally appeared in La Concha, the quarterly publication of American Pilgrims on the Camino. The latest addition to the American Pilgrims on the Camino book list is Stacey Wittig’s Spiritual and Walking Guide: León to Santiago. American Pilgrims on Camino (APOC), a non-profit organization, provides information to pilgrims that includes links to online resources, book lists, CD and music lists and Camino essays. The APOC Camino reading list includes a wealth of books for pilgrims interested in walking El Camino de Santiago, an ancient pilgrimage route in northern Spain. The modern literature on the Camino and on pilgrimage encompasses not only many walker’s guides, but also cultural handbooks on art and architecture, personal narratives and reflections, novels and more. Listed in the “Guide Books (In English)” category, Spiritual and Walking Guide: León to Santiago is included with other well-known Camino books such as John Brierley’s Pilgrim’s guides and maps to the Camino de Santiago and the Camino portugués, and Bethan Davies’ and Ben Cole’s Walking the Camino de Santiago. “I am very honored that American Pilgrims on the Camino includes my book on their Camino reading list,” continued the writing pilgrim. The Camino devotional is now listed on the reading lists of three of the world’s top Camino de Santiago websites. Author Stacey Wittig has written a spiritual guide for walking from León, Spain, to Santiago. What about pilgrimage helps you let go of fears and find peace that passes understanding? How can you be still and hear God’s voice as you trek the ancient pilgrimage route? How will you prepare your heart for a closer walk with God on the Camino? Find answers to these and other questions in this daily devotional and walking guide. Included in this book are daily scripture readings, meditations and questions for reflection to make the most of your pilgrimage and on the more practical side, details about where to sleep, daily distances walked and essential websites, insider travel tips, how to obtain a credential, how to follow the route without maps. The book contains space to journal thoughts and revelations.